There are many themes that just keep on cropping up in slot games. There’s pirates galore, so much fruit you could open up a food store and then there’s Egypt. If I had a pound for every Egyptian themed slot game that I’ve seen I might not need to play them in order to win some cash. ‘Golden Ark’ is another one that has an Egyptian theme but this Novomatic slot also has been influenced a fair amount by a certain female explorer. Our intrepid explorer finds herself in Egypt trying to discover the secrets that the Golden Ark contains. We’re more interested in the riches that this game can provide for us. With there being so many slot games that feature this part of the world, it’s important to try and come up with something a bit different. Novomatic have had a pretty good job here The symbols are really spectacular and though there’s nothing particularly new, they do look great and really add to the enjoyment of playing the game. 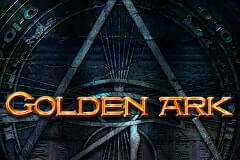 Golden Ark has five reels and there’s ten paylines on its three rows of symbols. Playing the game will cost you between £0.40 and £100. As you’ll read though it’s important to be activating a fair few of the symbols in order to trigger the bonus game, just ensure you play within your financial budget. This slot will also appeal to the high rollers out there. Those symbols are a mixture of those that are theme-related and others that aren’t. Theme-related ones are the female explorer, a golden scarab, a golden statue, the Eye of Horus and a book that may contain many an interesting story. Then there’s the ten to Ace playing card symbols that look good but not in any way Egyptian. The book is the wild symbol in this game. It can get you some good wins by substituting for other symbols and forming winning combinations. It’s pretty useful on its own though because five on an activated payline wins you 4000x your line bet. It can’t sub for the Eye of Horus which is the scatter symbol here and plays a key role in triggering the free spins round. More about that shortly. The highest paying symbol is the attractive looking female explorer who pays a 10,000x multiplier for five on an activated payline. Make sure you have a good look at the paytable in order to boost your knowledge of the game. Having a few free games will also help you get used to how the game runs, especially the bonus game and the gamble feature. Everyone wants to get their hands on some free spins and that’s what are available in this game. To get ten free spins you need to get at least three of the scatter symbols on an activated payline. That’s a bit different because often they can be anywhere on the reels. It means you have to be activating more paylines so do that but keep an eye on your financial budget. During the free spins there’s an expanding symbol bonus feature and this can really help get you some good wins. During the ten free spins the expanding symbol covers the entire reel it’s on and this can really help form some winning combinations. The symbol is randomly selected. The game also contains a gamble feature. As is the case in many Novomatic games this crops up when you get a winning combination. You don’t have to play it and can just go onto the next spin if you want. If you do play it, then your task is to guess the colour of the next card in order to double your win. Get it wrong though and you lose your winnings so be careful with this. I love the look of this game, really classy. It’s entertaining to play and although the theme has been done many a time, it’s still well worth playing. The bonus game is a good one with the expanding symbol but keep an eye on your budget as you try to trigger it. Also be careful with the gamble feature and don’t just lose wins you’ve worked hard to get.